Meets ANSI Z98.1-2003 Standards Type 1, Class C, G and E.
Offers impact and penetration resistance. Shell constructed from high density polypropylene materials. No rain trough - Prevents pooling of liquids. Soft brow pad is replaceable and washable. 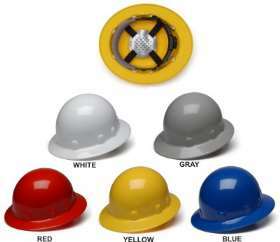 Ideal for linemen - Completely dielectric with no metal parts. Replacement suspensions are available bellow. Large logo area on front, sides and back.